equipped with bright LED lights and an intuitive, interactive interface that provides instant alerts to gas readings or alarm levels. The interface also includes password-protected menus for configuration, test and calibration. Easy installation. 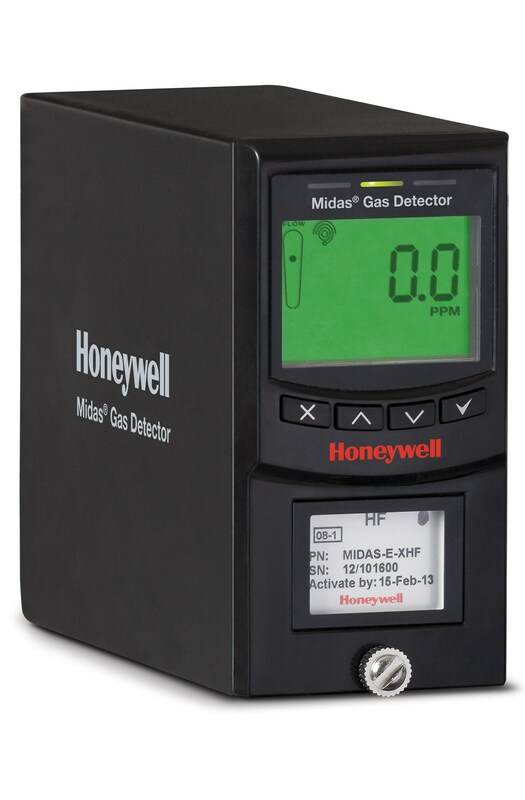 Compact in size with an easy-to-handle metal chassis, the Midas Gas Detector is simple to install. That’s especially important in crowded, complex process environments where space is at a premium. Numerous applications. With feature-rich capabilities that are easy to use, the Midas Gas Detector is suitable for many industry applications, including semiconductor processing, light industrial manufacturing, university laboratories, aerospace, wastewater and more. We recently discovered a potential security vulnerability in our Midas Gas Detector transmitter (part number MIDAS-T-004). Honeywell has prepared a free, downloadable security patch to correct the issue. Passwords should always be used on installations of Midas to prevent unauthorized access. Allow only trained and trusted persons to have physical access to their system, including devices that have connection to the system though the Ethernet port. If possible, isolate your system from the Internet or create additional layers of defense by placing the affected hardware behind a firewall or into a DMZ. If remote connections to the network are required, consider using a VPN or other means to ensure secure remote connections into the network the device is on.